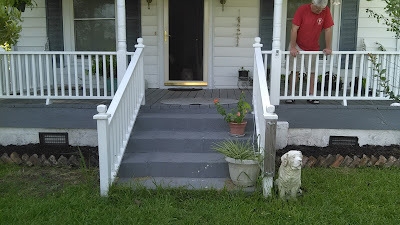 On Monday Adam did some work on our ugly flower beds in front of our porch. 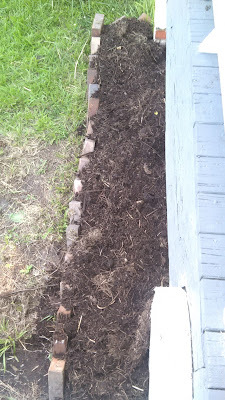 First he brought lots of mulch -- all the mulch that was inside the big potato bin -- and piled it in the beds. He'd also lined the beds with bricks. 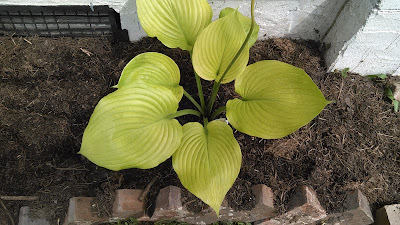 I had one hosta my sister-in-law had given me in the spring. I'd put it in another spot, but I moved it up front. It's on the far left. 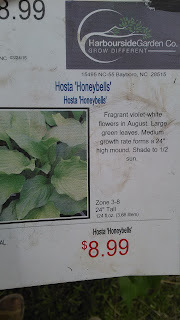 Tuesday morning first thing I dashed to the local nursery and bought three more hosta. I figured four big hostas out there should fill the beds nicely, eventually. 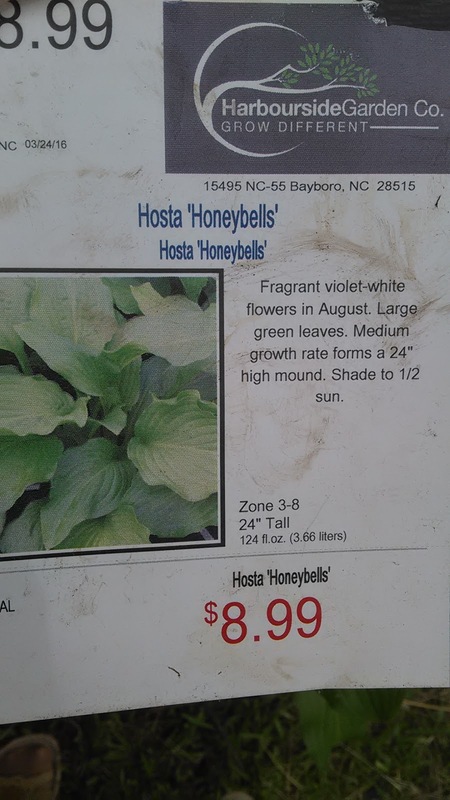 I bought two of these, one on either side of the steps -- "Honeybells" hosta. Much better! They will fill in that space, prevent weeds, bloom prettily, and require little care. 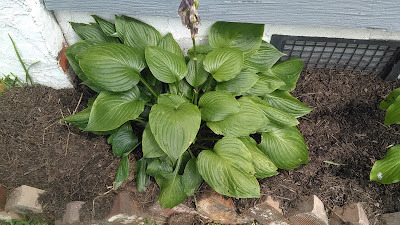 The beds get some sun now (maybe more than a hosta would prefer), but when we put up a privacy fence sometime in the next year, they will be in nearly full shade, which is why I chose hostas. 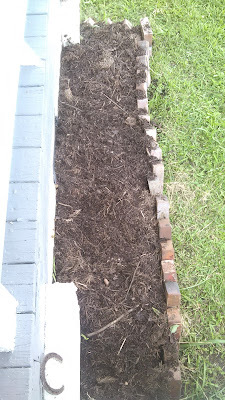 Here's the spot where the lone hosta was living before today. It's the ugly spot around the house, and I'm still trying to decide what to do with it. 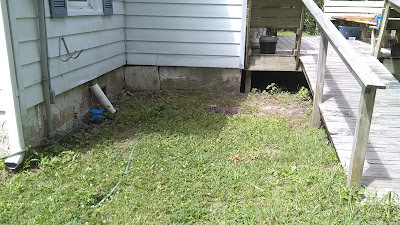 It's right next to the back deck; we walk past it every day, all day. It's in nearly full shade most of the time. Hmm. I had a friend in Alabama who had a huge bed of impatiens on either side of her front door, in full shade. They reseeded and came back year after year - can you believe that? We're not quite that warm and subtropical. The first thing that'll have to happen is for Adam to till it up and make it into a place with deep, delicious soil. Maybe that'll spur my imagination. What do you think? What would you plant there? Hmmmm. Coleus? It's so different looking. 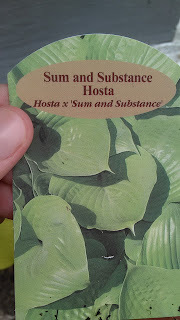 I like your hosta idea! Do ferns grow in your area? I love the look of those growing close to the house. 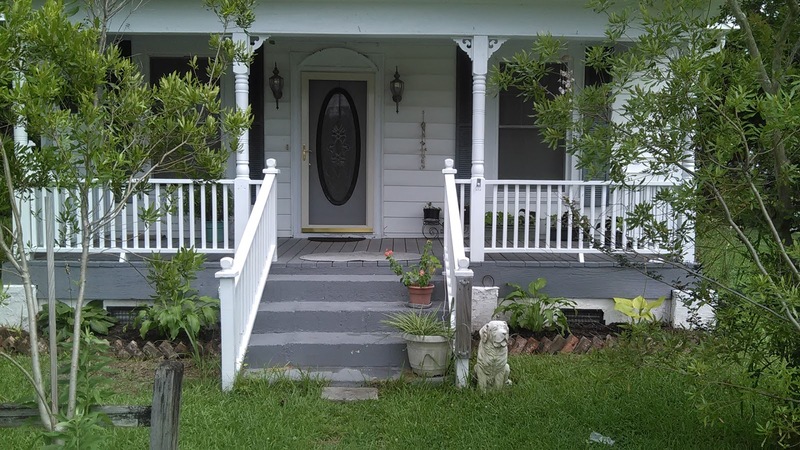 Your front flower beds look so homey and inviting! So many nice touches! Your front brick edged hosta bed looks great! I'm sure you two will come up with some wonderful idea for the spot by your deck. Look around your area and see what others are growing in shade gardens. I like the idea of ferns, too. So pretty by a house. But practically speaking, mint will survive even in nearly full shade, and it's so handy by the back door. Lily of the Valley, ferns, impatiens (for color). Pretty!!! The hostas look lovely. I have a few in full shade too. They're happy. 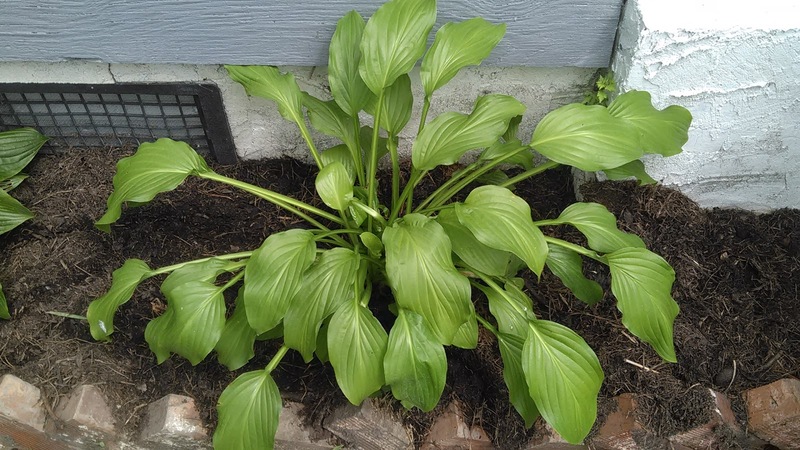 The hostas look great! Such robust-looking leaves!